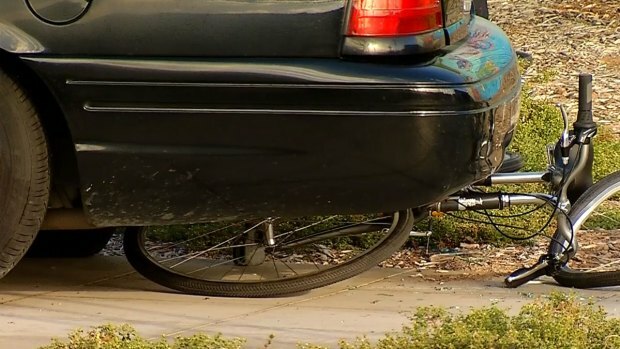 An accident in Barrio Logan between a motorist, a San Diego Police officer and eight cyclists sent five people to the hospital Sunday. The officer was responding to a domestic violence call, traveling southbound on Cesar Chavez at 4:30 p.m. when the officer's car collided with a convertible traveling east on Harbor Drive. Scott and Camille Martin of San Carlos were in the convertible with the hard top down. Both suffered multiple injuries ranging from bumps and bruises to broken bones. "It was a split second," Scott said. "The car appeared right in front of me. I just stomped on the brakes but we were already it seemed like a few feet from each other." The Martins say they had the green light and didn't hear a siren prior to the crash. "At the very last second, I saw him and then, the impact and then spun. Horrible," Camille recalls. It's not clear whether the officer was driving with lights activated. The officer was a block away from the call at the time of the crash. The collision spun the officer’s car up on to the sidewalk and into eight cyclists. All eight crash victims were visitors from Brazil in town for a four day convention. They were riding on bicycles they had rented to tour the city. The rear window of the patrol car was shattered. One bike ended up underneath the patrol car. The Martins feel the San Diego Police Department needs to reexamine its policy on responding to calls. 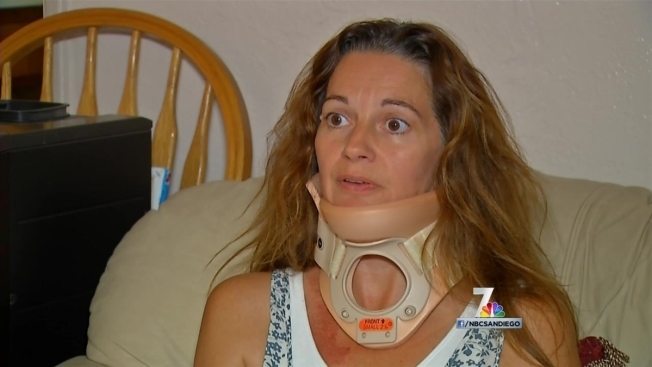 Camille and Scott Martin talk with NBC 7 about what they remember seeing moments before their convertible collided with a San Diego police cruiser. “My concern is I’ve seen it more than once where [police cruisers are] blowing through intersections at red lights. They often don’t use their sirens to clear the intersection like you typically would see with other emergency vehicles and I think that endangers everybody including the officer,” said Scott Martin. Scott Martin said he spoke with investigators and was not cited. He and his wife are grateful to the EMTs for their care and help in the moments after their crash. They also credit the car's airbags and seat belts for saving them from greater harm. “Obviously it is a scary sight anytime you have a vehicle that collides with a pedestrian on foot or on a bike it is a dangerous situation. Fortunately all the cyclists had helmets on and I think that prevented serious injuries in this case,” Lt. Paul Connelly said. The police officer was one of the five transported to the hospital. He has not been identified. The intersection was closed for three hours afterward. When NBC 7 asked for comment and a copy of possible video from the accident, the SDPD said its traffic division is conducting a thorough investigation of the incident and no further information is available at this time.